It was snowflake Monday at our house. 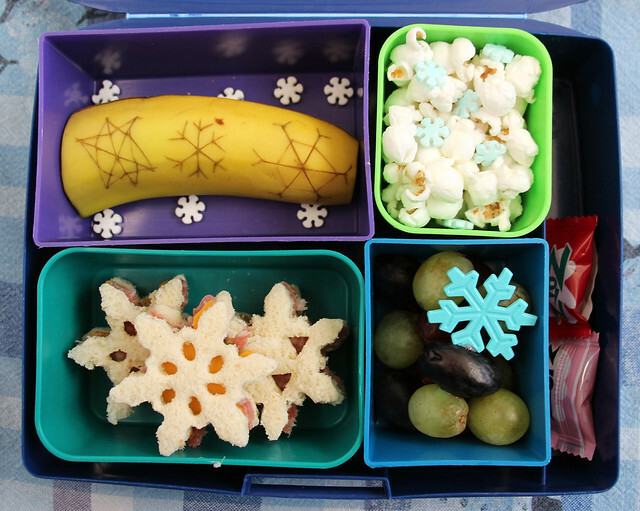 Wyatt’s lunch was packed in a Laptop Lunches box and it was filled with chilly treats: a banana with a few snowflake sprinkles around it, white cheddar popcorn (with even more sprinkles), grapes on a snowflake pick and salami, cheddar and pesto sandwiches cut into snowflake shapes . I carved a few snowflakes into the skin of the banana with a sharp knife and I also included two pieces of candy as a little treat. 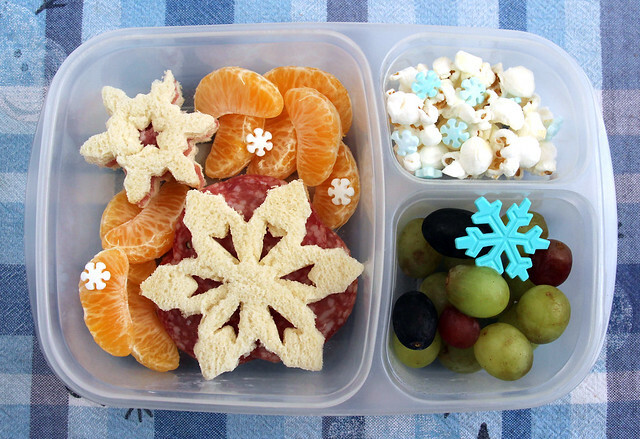 Augie also had snowflakes in his lunch: salami snowflake sandwiches, clementine wedges with a few sprinkles, white cheddar popcorn (again with the snowflake sprinkles ) and grapes on a snowflake pick. This was packed up in an EasyLunchboxes bento box . Doh! We were in a big rush on Tuesday morning and I didn’t have time to take pictures of the boys lunches. They were pretty boring looking though, so no biggie. They each had leftover black bean and corn chili in a thermos, a cornbread muffin and a clementine. 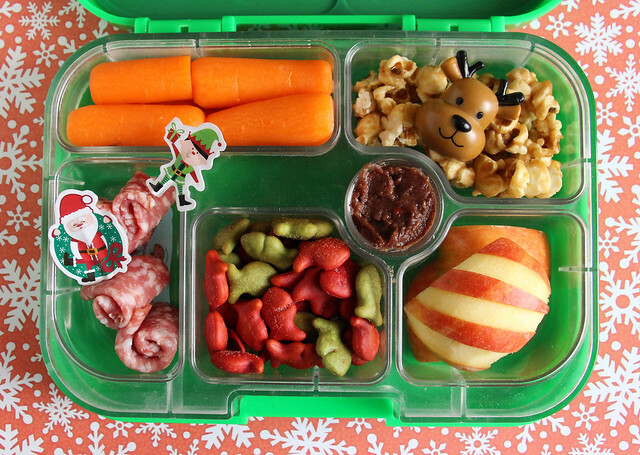 Wednesday, Wyatt had this Santa-ish Yumbox: carrots, black bean dip, caramel corn with a reindeer decoration, an apple carved to look like a candy cane, holiday Goldfish crackers and salami spirals on Santa and Elf picks. Santa Claus visited Augie’s lunch too: holiday Goldfish with a Santa ring in a square silicone cup , carrots, caramel corn in a rectangular silicone cup , a snap pea and tomato Christmas tree, clementine wedges, salami spirals and cherry tomatoes. This was packed in the PlanetBox . Thursday, I kept the kids’ lunches super simple. Wyatt had a Laptop Lunches bento: oranges, banana, mini saltines, white cheddar popcorn and salami. And Augie had a simple PlanetBox lunch: salami in a square silicone cup , clementine wedges, mini saltines, grapes and cucumbers. And on the Friday, Augie had his last Christmas lunch of the year. 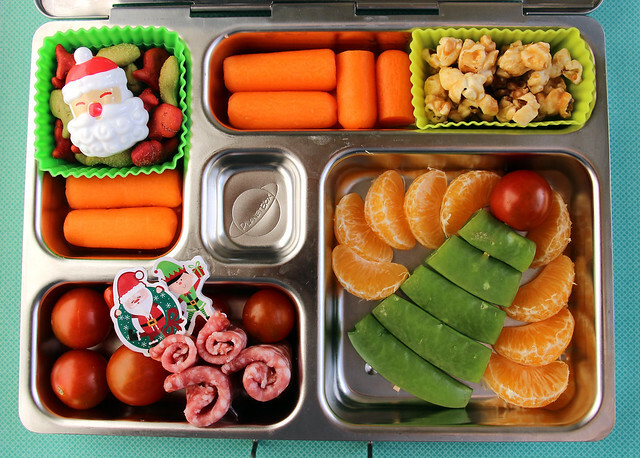 I packed this one in our festive, green Lego bento box : cucumber slices, holiday goldfish in the smaller, white Lego box , clementines in a rectangular silicone cups , dried mango, cherry tomatoes and salami spirals on paper Santa picks that were tucked into a square silicone cup . Wyatt wanted pizza so he had school lunch! Happy New Year, everyone! I hope 2014 is the best year ever!